The Class 222 train is the workhorse of the Midland Main Line. Where will they go, when they are replaced by new bi-mode trains in 20222? They have some good properties. Built in 2003-2005 and refurbished in 2011-2012. Meet all the access reguilations. Good ride on FLEX-Eco bogies. But there is the annoying noise of the under-floor diesel engines. In Have Bombardier Got A Cunning Plan For Voyagers?, I commented on a statement by Bombardier to upgrade these trains with batteries, to give full regenerative braking, improve their efficiency and require less running of the engines in stations. Would Electrically-Driven Trains Benefit From Batteries To Handle Regenerative Braking? There are two basic types of electrically-driven trains. Electric trains, which include electrical multiple units and trains hauled by electric locomotives like the InterCity 225. Diesel-electric trains, which include multiple units like Voyagers and the InterCity 125. In an electrically-driven train, the traction motors can be turned into generators to slow the train, by turning the train’s kinetic energy into electricity. Many electric trains can do this and the generated electricity is returned through the electrification system, so that it can power other trains nearby. This all sounds fine and dandy, but there is the disadvantage that all the electrification system must be able to handle the reverse currents, which increases the capital cost of the electrification. Fitting batteries to a train, to handle the electricity that is generated by regenerative braking is an alternative. Suppose a four-car train that weighs 200 tonnes is travelling at 125 mph and needs to stop at a station. My example train would according to Omni’s Kinetic Energy Calculator would have a kinetic energy of 86.7 kWh. To put that amount of energy into context, the traction battery in a New Routemaster bus is 55 kWh. So if a battery of this size was put into each car, there is more than enough capacity to store the energy of the train, when it stops at a station. When the train leaves the station, a proportion of this energy can be used to accelerate the train back to 125 mph. As regenerative braking is perhaps only eighty percent efficient at present, additional energy will need to be provided. But even with today’s primitive batteries and less-than-efficient traction motors, there are still substantial energy savings to be achieved. In Do Class 800/801/802 Trains Use Batteries For Regenerative Braking?, I looked at the question in the title. I found this document on the Hitachi Rail web site, which is entitled Development of Class 800/801 High-speed Rolling Stock for UK Intercity Express Programme. It was written in 2013 and I suspect every train designer has read it, as it gives a deep insight into the design of the trains. The document provides this schematic of the traction system. BC which is described as battery charger. The battery size is not disclosed. The APS supplies the hotel power for the train in two different voltages. Can the APS with the battery supply power to the Drive Converter? After a lot of reasoning, I came to this conclusion. I will be very surprised if Class 800/801/802 trains don’t have batteries. Looking at the schematic of the electrical system, the energy captured will at least be used for hotel power on the train. Hitachi have not said, if the batteries on the Class 800/801/802 trains can be used for traction purposes. Storing the regenerative energy in a battery can be used for one of two purposes. Hitachi’s Class 800 trains certainly use the electricity in the battery to power the hotel functions of the train like air-conditioning, doors, lights, power-sockets, toilets and wi-fi. In a diesel-electric train, this could give benefits. The engines generally won’t need to run in a station to provide hotel power. Less fuel will need to be expended to provide hotel power. If say the train has to halt perhaps because of a signalling or track fault, hotel power can be provided without running the engines. If batteries are supplying the hotel power, the train may have more power for traction. Overall, the diesel-electric train would be more efficient and would emit less carbon dioxide and pollutants. There is no engineering reason, why the energy in the battery can’t be used to actually move the train. But to implement it, could be complicated and expensive on an existing train. I’ll look at a few examples. The iconic InterCity 125s are unique, in that they are impossible to scrap. Just as they seem to beapproaching the end of their life, a devious engineer or marketing man comes up with a plan to keep them running. 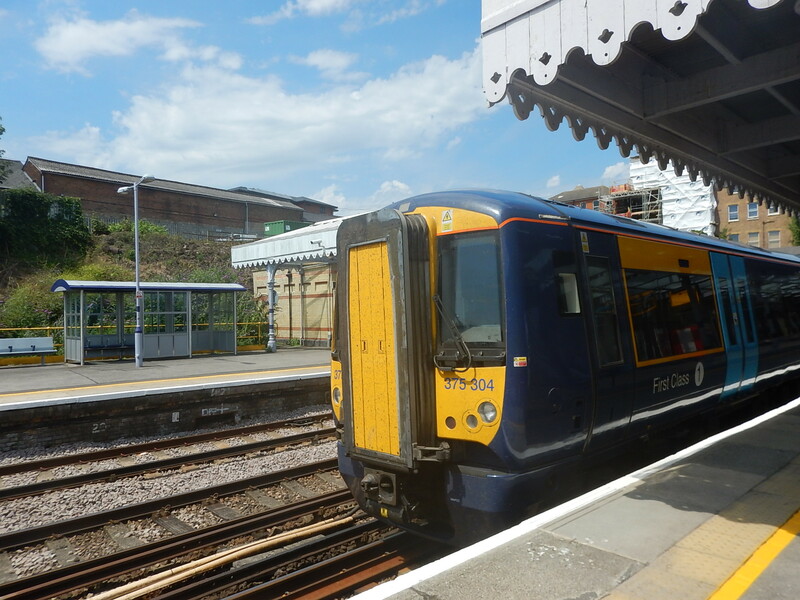 As I write this, Great Western Railway and Abellio ScotRail are testing short-formation InterCity 125s and training drivers for services in the South West of England and Scotland. Both train operating companies appreciate the marketing advantages of Terry Miller‘s world-famous train, that was built as a stop-gap, after the failure of the Advanced Passenger Train. So what size of battery would need to be fitted to each locomotive to handle the braking energy of a short-formation InterCity 125 with four passenger cars? Each Class 43 locomotive weighs 70.25 tonnes. Each Mark 3 coach weighs 33.60 tonnes. An eight car InterCity 125 can carry about 500 passengers. I will assume that a four-car InterCity 125 can carry 250 passengers. If each passenger weighs 90 Kg with all their bikes, buggies and baggage, that adds up to 22.50 tonnes. This gives a total train weight of 297.40 tonnes. Calculating the kinetic energy using Omni’s Kinetic Energy Calculator for various speeds gives. A fifty kWh battery in each locomotive would be able to handle the braking energy of the train. The only problem, is that Class 43 locomotives have DC traction motors, no regenerative braking and air brakes. But if any operator or rolling stock owner were bonkers enough to fit a new traction system, a diesel/electric/battery Class 43 locomotive is possible for a four-car InterCity 125. This page on the Hitachi web site is entitled V-TRAIN 2. Hitachi used a Class 43 power car to prove that diesel/electric/battery trains were feasible, before getting the order for the Class 800 trains. So fitting batteries to Class 43 locomotives has been done before! The simplest thing to do would be to use the batteries to provide hotel power for the train. In this exercise, I shall consider a Class 375/6 train, with the following characteristics. A weight of 173.6 tonnes. An operating speed of 100 mph. I will now go through my standard train kinetic energy calculation. I will assume three hundred passengers including standees. If each passenger weighs 90 Kg with all their bikes, buggies and baggage, that adds up to 27 tonnes. This gives a total train weight of 200.60 tonnes. It would appear that adding batteries to a Class 375 train would not involve large capacity batteries, especially if one was added to each of the three cars with motors. As a Control Engineer by training, blending battery and electrification power could run the train more efficiently. Probably naively on my part, I suspect that using batteries on Class 375 trains to handle regenerative braking, would be one of the easier installations. All Electrostars are fairly similar, so if Class 375 trains could be updated, then I wouldn’t be surprised if all could. 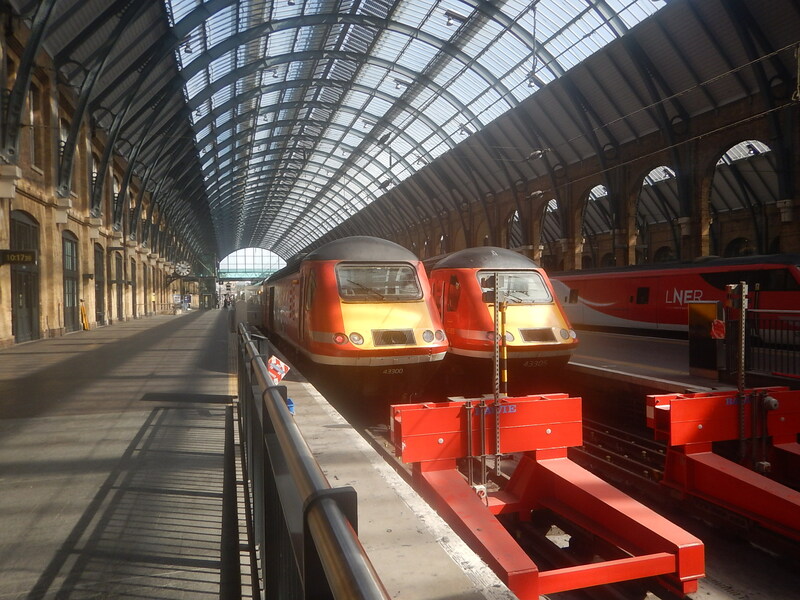 It looks like InterCity 225 trains will be used between London and Blackpool by Alliance Rail Holdings. 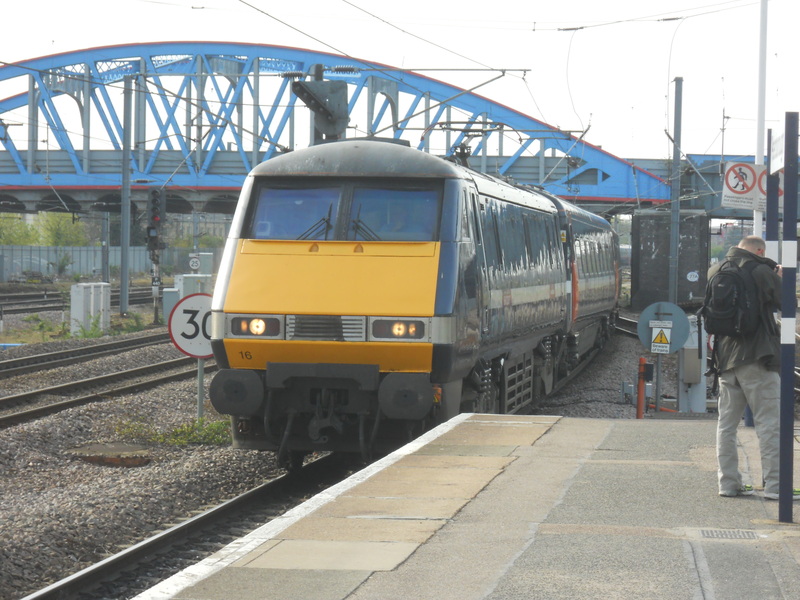 Other commentators have suggested that shortened sets run on the Midland Main Line between a diesel locomotive and a Driving Van Trailer (DVT) or two Class 43 locomotives. I shall do the energy calculation for a five-car InterCity 225. A Class 91 locomotive weighs 81.5 tonnes. A Mark 4 coach weighs between 40 and 43.5 tonnes. A nine-car InterCity 225 seats 535 passengers. I will assume that a five-car InterCity 225 will seat around 300 passengers. I will assume each passenger weighs 90 Kg. with all their baggage, bikes and buggies. A DVT weighs 42.7 tonnes. For a current nine-car train this gives the following. The empty train weight is almost exactly 500 tonnes. The passengers weigh 48 tonnes. This gives a total weight of 548 tonnes. At 125 mph, the nine-car InterCity 225 has a kinetic energy of 238 kWh. For a proposed five-car train this gives the following. The empty train weight is almost exactly 333 tonnes. The passengers weigh 27 tonnes. This gives a total weight of 360 tonnes. At 125 mph, the five-car InterCity 225 has a kinetic energy of 156 kWh. Reduce the speed to 110 mph and the kinetic energy drops to 121 kWh. I suspect that using current technologies, there is not enough space in a Class 91 locomotive for the batteries. Perhaps a short section of the coach next to the engine could be converted to hold a large enough battery. This has been suggested in Modern Railways by Ian Walmsley and I wrote about it in Midland Mark 4. A Class 43 locomotive weighs 70.25 tonnes. The train weight is 376 tonnes. At 125 mph this train would have a kinetic energy of 163 kWh. I’m sure that it would be possible to put a 100 kWh battery in the space behind the engine of a Class 43 locomotive, so I suspect that all the engineering solutions exist to create a train with the following characteristics. Two Class 43 locomotives with new traction motors to enable regenerative braking and a 100 kWh battery. Five Mark 4 coaches meeting all the regulations. The batteries would provide hotel power for the train. It may be a fantasy, as the economics might not stack up. I wrote about this combination in Five Mark 4 Coaches, A Driving Van Trailer And A Stadler UKLight Locomotive. The concept or something like it, has possibilities. A lot of the article takes the form of reporting an interview with Des McKeon, who is Bombardier’s Commercial |Director and Global Head of Regional and Intercity. The Voyager family of trains has three members. Class 220 trains – Voyagers – 34 trains of four cars – operated by CrossCountry. Class 222 trains – Meridians – 27 trains of four, five or seven cars – operated by East Midlands Trains. The trains are diesel-electric and I explore the possibility of using batteries in these trains in Have Bombardier Got A Cunning Plan For Voyagers?. I felt is was a good plan. In answer to the question, that I posed in the title of this post, I feel that handling regenerative braking in batteries on the train could be of benefit. Have Bombardier Got A Cunning Plan For Voyagers? The trains have the following characteristics in common. They are diesel electric multiple units. Each car is powered by an underfloor Cummins QSK19 diesel engine of 750 hp/560 kW. They are capable of 125 mph running. Some trains are fitted with tilting, which isn’t used. The trains have rheostatic braking. They meet or could easily meet the latest accessibility regulations for passengers of reduced mobility. Train length appears to be flexible and cars seem to be able to be swapped around in a particular class. I think it is true to say that the operators have a few problems with these trains. Some passengers think the trains are rather cramped. There is also a noise and vibration problem when the engines are working hard. There have been problems with seawater getting in the resistor banks for the rheostatic braking on Class 220 trains at Dawlish. CrossCpuntry would welcome extra capacity. Both operators would probably welcome better fuel consumption on the trains. How Would You Fit A Battery To A Voyager? All these trains seem to be fitted with rheostatic braking. Effectively, the traction motors generate electricity when they work in reverse to slow the train. On a modern train this electricity is either returned through the electrification to power other trains or stored in a battery. But on these Voyagers, it is passed through resistors on the roof and used to heat the sky. Consider these facts for a four-car Class 220 train. The train has an operating speed of 125 mph. Each car has its own diesel engine. The train has a weight of 185.6 tonnes. The train has seats for two hundred passengers. If we assume that each passenger weighs 90 Kg. with their baggage this gives a total train weight of 203.6 tonnes. 125 mph – 89 kWh. Every time a train stops, this energy goes to waste. The simplest thing to do, would be to divert this energy to an appropriately sized battery in each car. As there is four cars in the train, a battery of 50 kWh in each car would probably be sufficient. If the battery was full, then the energy would still go to the resistors on the roof. You’ve now got a full battery, but how would you use the energy in a productive manner? The easiest and probably best thing to do with it, is to power the hotel functions of the train like air-conditioning, lights, doors and toilets. This is an approach taken by Hitachi on their Class 800 trains, as this diagram confirms. The diagram is contained in this document on the Hitachi Rail web site, which is entitled Development of Class 800/801 High-speed Rolling Stock for UK Intercity Express Programme. The document is a fascinating read. Using the energy to power the traction motors and move the train might be possible, but I suspect it might be too complicated and expensive. 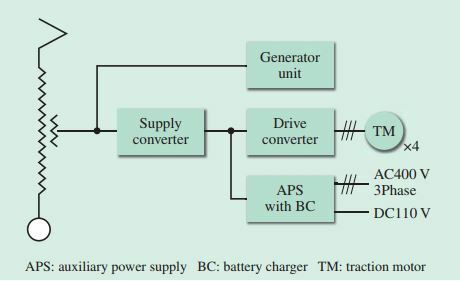 The simple system of the braking energy charging the battery and then using this energy for hotel power has advantages, both for Hitachi and Voyagers. The engines generally won’t need to run in a station to provide hotel power,as Des McKeon noted. The control electronics would be reasonably simple. Many of the existing expensive components like engines and traction motors probably wouldn’t need to be changed. There might be maintenance savings on the brakes. I obviously don’t know how independent each car is from the next, but if each is independent, then there could be further advantages in converting, testing and maintaining the cars. It looks to be a good plan.